K&N's RK Series air intake systems have been developed to get more horsepower from your Harley-Davidson® motorcycle. Built around the legendary K&N high-flow air filter, the RK series assembly includes an innovative powder coated, billet aluminum back plate that eliminates external breathers and features a built-in, dyno tuned velocity stack. The result is a significant airflow increase to the engine without sacrificing filtration. 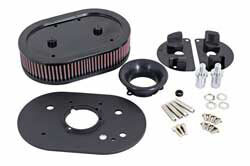 This RK series assembly retains a factory appearance by utilizing the stock air cleaner cover.